Game description: Created by Harmonix, the leading developer of music-based games, Rock Band is the ultimate platform for gamers to experience music, giving players the chance to rock out in the shoes of the biggest guitarists, bassists, drummers and singers of all time - as a solo superstar or as part of a hard rocking band. Built on unprecedented deals with top record labels and music publishers, the music featured in Rock Band spans all genres of rock and includes many master recordings from legendary artists. 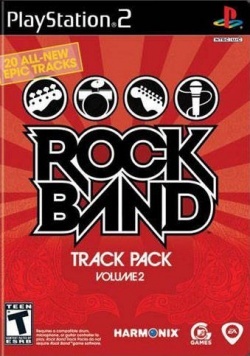 Rock Band Track Pack Volume 2 is a standalone software product that allows owners of Rock Band Special Edition and Rock Band 2 Special Edition or Rock Band (1 or 2) peripherals to keep the party going with more hit songs from the pantheon of rock music, hand-picked with care by Harmonix. This page was last edited on 13 January 2017, at 12:05.